Dental Needle Phobia? New Needle Free Injection Technology is Available! In recent times there have been various advances in dental technology geared towards making dental procedures as comfortable as possible for patients. In spite of this, about 85% of the adult population in Australia faces some degree of anxiety about painful or uncomfortable procedures when visiting a dentist. A lot of this is due to the fear of painful needles, and oftentimes simply the anticipation of pain is enough to deter many from visiting dentists regularly. Healthy Smiles Dental Group has always been at the forefront of dental services in Melbourne, with state-of-the-art tools, techniques and technologies handled by highly experienced staff. We are also fully committed to the well-being of our patients. As a result, we’re consistently investing in technology that makes all dental procedures as comfortable as possible for our patients. This includes Injex, which is a needleless local anaesthesia, and the Wand, which provides virtually painless dental anaesthetic. Through this post we aim to introduce you to the latest developments in dental technology we offer at our practice. The use of Injex for dental procedures has been gaining popularity in recent years, giving dental practitioners the ability to administer local anaesthesia and other medication without using needles. Injex works by using a short burst of high pressure to deliver the medication uniformly in a spray-like manner, rather than inserting a needle into the gums. Why is it better for patients? The strongest motivating factor for patients is the painlessness of this process – it takes a fraction of a second with virtually no discomfort. In addition to making dental procedures relatively painless, using such technologies for local anaesthesia has several other benefits as well. Drugs administered through Injex have a much shorter uptake time, with rapid diffusion of the medication in the region. This means that the chemicals reach effective concentration levels much quicker, and effects of the anaesthesia are noticeable immediately. With this technology, lower doses need to be delivered to observe a similar level of effect, and the risk of side effects of any medication is substantially reduced. 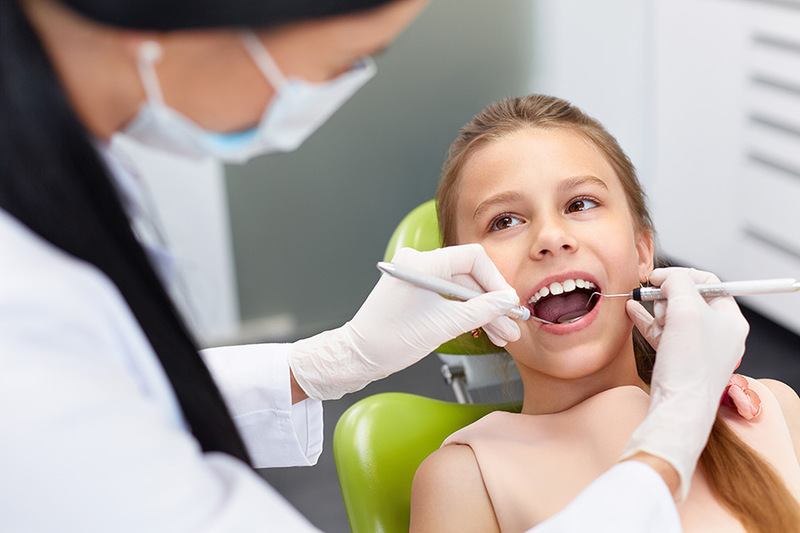 While all of these are hugely beneficial for people of any age, Injex is great for children in particular, who not only have a greater fear of dentists and needles but also lower dosage limits for medication. Firstly, needleless injectors are safer and more hygienic as compared to traditional anaesthetic delivery systems. This is especially helpful if patients are worried about needles being reused and spreading infections. Using Injex also completely eliminates any risk of intramuscular injections. What this means is that the pain and discomfort felt in the region after the anaesthesia wears off is extremely minimal. The Wand is another of the painless dental technologies adopted by Healthy Smiles which allows our dentists to deliver medication painlessly. The Wand is essentially a computerised anaesthetic delivery system, offering control over the pressure, volume and precise rate of flow of the medication being delivered. The most common misconception among patients is that the pain felt during injections is caused by the needle pricking the skin. However, it’s actually the uneven delivery of the medication into the tissues that causes most discomfort. Because it’s entirely computerised, the Wand eliminates this by delivering the medication appropriately at a constant pressure to automatically compensate for differences in tissue densities. What’s even better is that this pressure can be controlled to remain below each patient’s threshold of pain. This means that patients experience virtually painless injections firstly due to minimal feeling of the injection itself as well as the delivery of the medication. Injections with the Wand are in fact so painless that patients feel hardly any discomfort even in potentially difficult areas such as the palate. Administering injections with a computerised delivery system like the Wand is highly popular because of the precise control and reliable injections it offers dental practitioners, even in difficult areas. Using the Wand also removes any “human error” with safety features such as a self-retracting needle, so even the most anxious patients can rest easy. No patient should feel like their options are restricted, and that fear of dentists and needles is something they just have to live with. There are always options available, and your dentist would be in the best position to advise you on the most appropriate one for you. The most important thing to remember is that visiting your dentist doesn’t have to be an ordeal. At Healthy Smiles, our friendly and professional staff are always happy to assist you with any uncertainties or fears you may have about your dental visits. Call in to our practice at 03 9877 2035 or drop us an email at info@healthysmiles.com.au for a free no-obligation consultation!